An asterism is not the same thing as a constellation. Constellations generally come to us from ancient times. Earlier in this century, the boundaries of 88 constellations were officially drawn by the International Astronomical Union. On the other hand, asterisms are whatever you want them to be. They are just patterns on the sky’s dome. You can also make up your own asterisms, in much the same way you can recognize shapes in puffy clouds on a summer day. 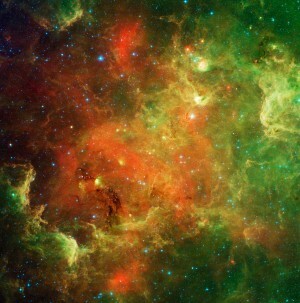 However, some asterisms are so obvious that they are recognized the world over. Here is one of those – the famous asterism known as the Summer Triangle. This pattern consists of three bright stars in three separate constellations – Deneb in the constellation Cygnus the Swan, Vega in the constellation Lyra the Harp, and Altair in the constellation Aquila the Eagle. 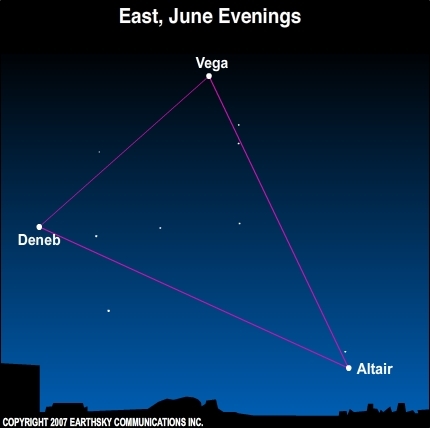 Learn to recognize the Summer Triangle asterism now, and you can watch it all summer as it shifts higher in the east, then finally appears high overhead in the late summer sky. How can you learn to recognize it? First, just go outside in early evening, face east, and try to notice three particularly bright stars. Those stars will probably be Vega, Deneb and Altair. Site contents copyright © 2019 Recorder Online	except as noted. All rights reserved. | 90 queries in 2.320 seconds.